Maximum Extreme - The Ultimate Movie And Lifestyle Website: Police Story 2013 Movie Review!!! We're already hoping there's gonna be a Police Story 2014!!! Jackie Chan proves why he's still the best! Read on for more!!! Jackie Chan is back in what I would consider his best serious role to date. New Police Story (2004) was a disappointment for many. It did not feature the same character nor have any continuity to the previous Police Story movies and left people wondering why it even carried the Police Story name. In hindsight, however, I think it wasn’t actually that bad. It’s on TV fairly frequently over here in Singapore and regardless of how many times I’ve seen it, I still find myself watching it to the end. Of course it pales in comparison to the gold standard set by the first 2 Police Story movies, but those 2 classics put most action movies to shame. But what New Police Story does deserve credit for is that it set the ground and expectations for subsequent Police Story movies. I went into Police Story 2013 not expecting Police Story 1 or 2 but something darker, grittier and more serious and that’s exactly what I got. Jackie has been hit and miss with his serious roles. Shinjuku Incident was just not that good a movie and although Little Big Soldier was good, it was not here nor there in terms of its dramatic tone – it still felt part serious and part comedy but never really embraced either genre completely. 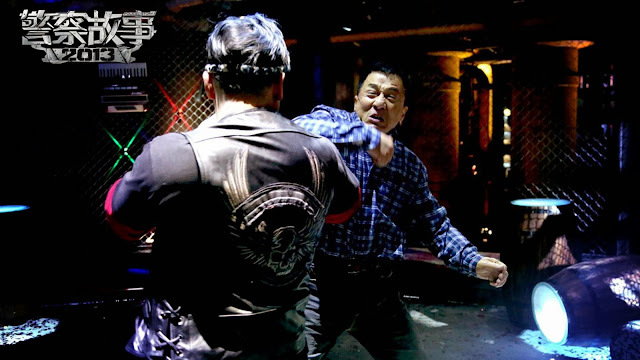 Police Story 2013, from Ding Sheng, the director of Little Big Soldier, hits the proverbial nail on the head and destroys it! This movie is badass!! The movie starts with Jackie, a decorated police veteran, on his way to meet his estranged daughter in a nightclub in China (that’s right – not Hong Kong). Ever since the loss of his wife, things have clearly been turbulent between the pair and his daughter (Tian Jing) appears to have become quite rebellious against the father she felt was never there for her. Things take a quick and unexpected turn for the worst when the nightclub is locked down and Jackie, as well as other patrons in the club, are taken hostage. Henceforth, the movie turns into a gritty cop thriller as we join Jackie in his efforts to try and figure out who the bad guys are and what their motives are. The plot is twisted and turned and intertwined, making for some pretty good and dramatic cinema. This is definitely not the Police Story we have come to know and love. It is, however, a darn good story about police. Those expecting Jackie’s trademark brand of ultra fast perfectly choreographed fighting will be left disappointed. This is definitely not a kung fu / martial arts movie. There are only a handful of fights and they are kept very real and visceral. Jackie, possibly for the first time in ages, looks like he can do serious damage. A cage fight in particular is very brutal but fits the tone of the movie perfectly. Remember, first and foremost this is a cop thriller and it’s a tense one at that, especially as the story turns into a ‘who done it’ sort of detective movie. I enjoyed this movie a lot. A great story, a fine thriller and characters we grow to really care about as the story unfolds. Sure it’s not for everyone. If you’re an action junkie or have traits of ADHD then you should probably look elsewhere. Also noted that replay value is probably not that great. But those looking for a tense thriller to sink their teeth into, something that will keep you thinking and on the edge of your seat, then you need not look any further. A great night at the movies and Jackie’s best performance in a serious role to date! Highly recommended! Check it out! Tian Jing vs a muscular female fighter! Who would win? !